Need help to start a petition? GoPetition aims to amplify voices, both large and small. The petition tools we provide help empower both individuals and groups. By amplifying voices together we can help eliminate powerlessness. One way to achieve this goal is to provide easy-to-use tools within a robust social network to give both individuals and groups a voice. If you want to create a petition, this short article provides essential guidelines. Creating a petition is not as difficult as you might think. However, you first need to decide whether to start a paper petition, an e-petition, or both. The points raised in this outline can be applied to making both online petitions (e-petitions) and paper petitions. The issues raised below are designed to help campaigners write and start petitions that will have a positive impact for specific and well defined causes. You need to take into account a number of issues such as the requirements of your target (procedural, legal or otherwise), proper research, clear communication, and how you will market and promote your petition. Before you create your petition, we recommend that you ask your target for petition rules (if the target is a government organization, legislature or parliament). But please note that many petitions do not need to comply with any guidelines because many petitions are written to organizations and groups that do not have guidelines. Petitions to parliaments should follow local jurisdictional procedure. You may however bypass Parliament or Congress by sending your petition to the Executive Branch of government such as directly to the President or 10 Downing Street, or directly to your State or County representatives. A petition should begin with a request, followed by well researched reasons for making the request. Each petition should provide a description of relevant circumstances and links to documentation or facts that support that description. Importantly, a petition should contain information that suggests its request is feasible. Ultimately a petition will request specific action or a call for someone (or some group or organization) to refrain from specific action(s). explains why it is needed. Be clear and concise with your message. The petition preamble should be short. Make a petition that has clear logic and sound arguments. Keep all campaign statements as concise as possible, while laying out your concerns. Make focused, specific requests in your petition text. Start with general principles and progressively get more specific. Create a petition that has a clear focus so others can commit to your cause. Speak from the heart and tell your story with empathy. Create a narrative that is both personal and believable. Make your campaign visual. Photos and videos get traction. Find the decision-maker who matters. Your target should be specific and identifiable. Think local and global. Identify the local issues within the big picture. Reach out to the media and talk to the press, not just your own social network. How you promote your petition will have a critical influence on the outcome of your campaign. Combine your e-campaign with a paper campaign and synchronize your signature lists. Thus you may bring your petition to events where you expect there will be people who support it and can sign on the spot. Follow up: It is important because it demonstrates that there is real commitment behind the signatures. Contact your supporters. This will make your campaign both progressive and viral. For example, encourage signatories to write, call, or visit MPs to explain why they signed the petition. Ask your target to respond to your petition within 45 calendar days of its presentation. If this fails to occur, then follow the matter up with someone to whom the target is accountable. Contact media groups with an explanation of your campaign. Pump your social networks in a responsible way. Speak from the heart and don't spam. If your cause has value, it will go viral. Try to minimize the use of critical language when you promote. Use sound arguments rather than pejorative attacks which could be considered insulting. Have faith that a just cause is worthy of promoting. 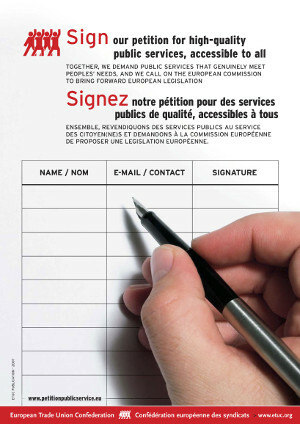 There are many examples of high quality petitions at GoPetition. So we suggest that you read some of our more popular petitions and use these as templates before you create your petition. For further advice on how to write a petition, don't hesitate to contact us. How to create a petition with instant access now! GoPetition has advanced edit software that allows you to add updates, news items, photos, videos and other material to your petition at any time. You may also link to your website from your petition. A free forum facility is also provided with every petition. How can I market my petition? We suggest a strategic use of social media such as YouTube, Twitter, Facebook and other social networks. You may also wish to issue a media release and contact key media and news groups directly. How you market your petition will have a critical influence on the outcome of your campaign. We are committed to quality customer service and advice for those who have uploaded a petition on our platform. If you need help to create a petition please refer to our link list below. Join GoPetition and write your own online petition today! To create a petition with instant access now, click here.